A new technology that is an important step in terms of safety has appeared recently. I’ll call that intelligent brakes. The germans are behind it, BMW’s calling Active Cruise Control, and describes it as a protective systems that warn the driver in advance of an accident and prepare the driver and the vehicle for impact in the event of an unavoidable collision. With the help of sensors, here’s how it works. The first goal of the system is to alert the driver if something gets in the way, be it a car or anything else. It works in stage. In the event of a potential collision with the vehicle in front, the driver is first given a preliminary warning by means of an illuminated red vehicle symbol on the instrument panel and on the Head-up Display. At the same time, the braking system is prefilled and the minimum triggering level of the hydraulic brake assistant lowered. This ensures that in an emergency brake pressure is built up faster when the driver applies the brakes, therefore significantly reducing the stopping distance. If the danger of collision is acutely imminent, the second stage of the collision warning commences. In situations demanding particularly rapid intervention by the driver, the system activates an acoustic signal in addition to the visual warning. Should the driver still not react to the request to apply the brakes, a time-limited delay procedure is activated: The car brakes for 1.2 seconds with reduced deceleration, whereby speed is already reduced before the driver can apply the pre-tensioned brakes. Based on the information supplied by the radar sensor of the Active Cruise Control system (ACC Stop &Go) featured in the new BMW 5 Series, the system detects when a collision can no longer be avoided by the driver’s reaction. In this case, an automatically activated emergency brake application function ensures that collision speed is, nevertheless, significantly reduced. 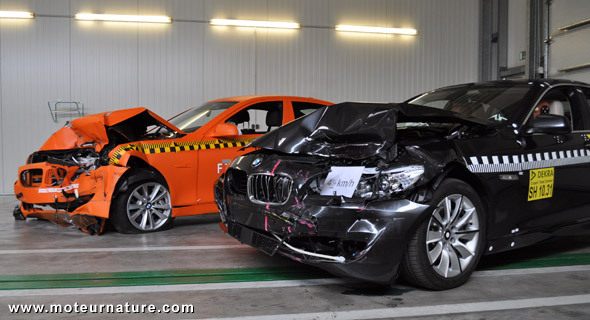 To prove the system’s effectiveness, BMW has crashed 2 cars. Both brand new 5-Series. On the first one, the system was switched off. The crash was performed at a speed of 64-kph (40-mph). On the second car, the system was fully active, it reduced that speed to 40-kph (25-mph).